This function enables conversion of VHDL code into schematic diagram. 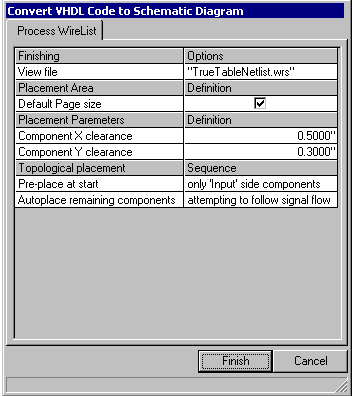 Conversion procedure is divided into three steps using dialog invoked from menu Tools - > Convert VHDL Code to diagram. In the dialog that opens, the maximum number of inputs/outputs is limited to eight. Inputs and outputs have settable name prefixes and are numbered from 0 to 7. Diagram may be appended to currently edited page. Diagram may be appended as a new page in currently selected circuit. 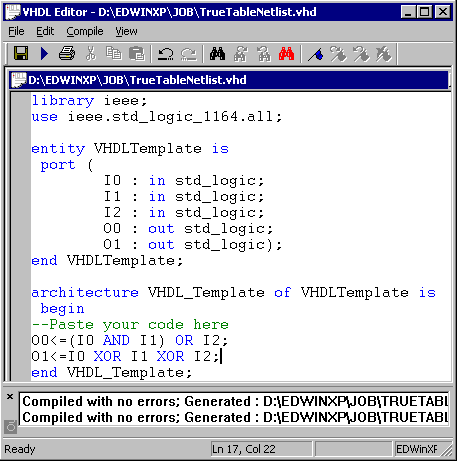 Components in the diagrams resulting from conversion of VHDL code may be automatically placed according to selected placement in the schematic. The nodes connecting wires are automatically routed. These automatic functions are optional. Diagrams where auto placement option is deactivated cannot be auto routed. Clicking ‘Next’ button opens VHDL Editor. VHDL Entity Template is automatically generated. After writing the required code (in any level of abstraction), save and compile. The successful compilation of VHDL code will result in the VHDL code conversion to schematic wire list format. The file with wire list is stored in temporary folder under fixed name ‘True TableNetlist.wrs’. Listing of this file may be invoked from the dialog that pops up when conversion is successfully completed. 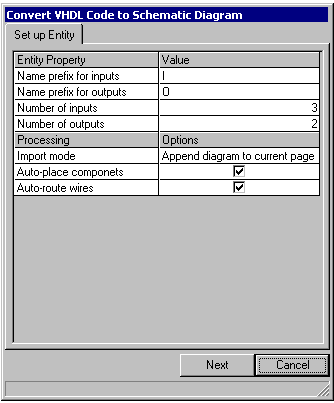 This dialog allows setting finishing options for processing of diagram - like page format and parameters for automatic topological placement of components. After clicking ‘Finish’ button, the netlist is imported, components placed and all the connections are routed. The new diagram may be placed in desired position on the page.